Drones: every military wants ‘em. But if you’re a country like Iran, sanctions can put a bit of a crimp in your efforts to build an unmanned aerial vehicle fleet. To get around the problem, Iran is turning inward, using drone development competitions to gin up new ideas for homebrew UAVs. Today America enjoys a distinct military advantage, thanks to its unmanned air force. Tomorrow, that advantage is likely to vanish, thanks to contests like Iran’s Div-e-Sepid. Competitors from up to 65 teams square off by racing their homemade drones around Mount Damavand, Iran’s highest mountain peak. In the Homa Sazan competition, sUASnews.com notes, drone makers test their designs against a series of increasingly complex real-life missions. Their UAVs, equipped with small cameras, fly over patches of land and sea looking to see who can spot hidden markers, relay their precise coordinates and accomplish other tasks. The missions are supposed to get increasingly more complex as the annual contests continue. From a military perspective, the competitions’ goals are fairly anodyne: finding wood smugglers and spotting those in need of rescue on land and sea and dropping small packages of rescue supplies. But like just about any kind of technology, the capabilities can be used for a variety of purposes. A UAV able to spot that wood smuggler might also be useful for identifying targets on a battlefield. Just this week, Iran bragged about a new drone designed by students at Tabriz University. 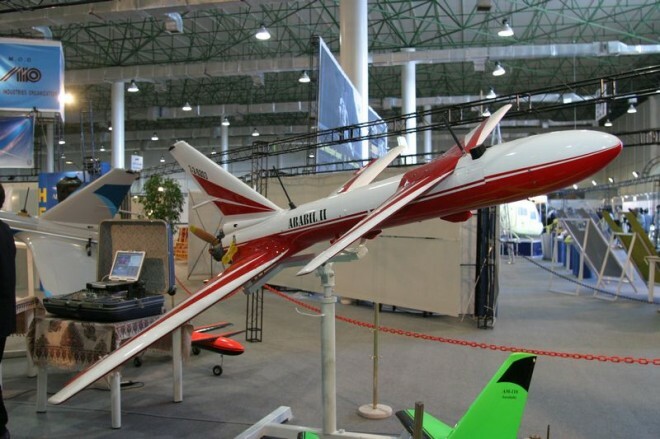 The Sharapah (meaning “butterfly”) is a high-altitude drone, according to an official Iranian mouthpiece, capable of reaching heights of 15,000 feet. It reportedly can hover for up to three hours and has a range of about 12 miles. The report comes as part of Iran’s chest-puffing for the “Week of Sacred Defense.” The occasion, marking Iran’s grueling eight-year war with Iraq, came complete with a Thursday parade, showing off Iran’s drone fleet and other weaponry. They do, however, have a habit of exaggerating their capabilities a bit too much, though. In 2010, Iran claimed to have successfully tested a “radar-evading” drone, the Sofreh Mahi (announced somewhat ludicrously in the propaganda armFars Newsnext to a photo of the American B-2 bomber breaking the sound barrier). The “ambassador of death,” the bombing drone Karrar, is probably closer to an envoy of annoyance. Iran also has a habit of outright lying about its weapons prowess in general, sometimes to the point of absurdity. While Iran has certainly made some strides in its domestic drones development, they’re likely shy of the awe-inspiring machinery of mass death the Mullahs would have you believe.